Tiffany & Co will launch a new fragrance for women. The eponymous scent is the brand's first in 15 years, and was created under new licensing arrangements with Coty. 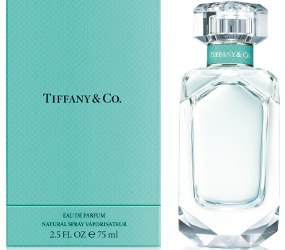 Tiffany & Co Eau de Parfum was developed by perfumer Daniela Andrier and centers on iris. Tiffany & Co Eau de Parfum will be available 30, 50 and 75 ml ($75-$132) and in matching body products. It will debut in selected Tiffany stores in August, and go into wider distribution in October. [...] This sparkling floral musk fragrance is designed around the noble iris, a flower long associated with Tiffany as a recurring motif in its jewelry designs. I liked the original Tiffany. Trueste, which was my wedding perfume was glorious. I really hope this one is good, and am looking forward to trying it. Pretty sure I never tried any of them. Hope this one is good too. I have been using Tiffany Eau de Parfum since November 2004… today my husband came home with the NEW Tiffany & Co ( a Birthday present), because the original has been discontinued. The sales person told him it was exactly the same but it is not. The original was amber in colour while this perfume is colourless. The original fragrance was a show stopper while the new fragrance smells like everything else out there and has an extremely short life. I will have to look for a new signature fragrance. C’est la vie! That special X factor is missing from this potion. Too sweet and powdery…no mystery to it at all…. Trueste was lovely-I went through 2 bottles of that one. I have Tiffany and I’ll wear that today! Am interested in this new one. I think I might need to sample this one, LOL. I liked the original Tiffany fragrance too but have not smelled it in a long time. I remember BWF with class. Also fangurl-ing over Daniela Andrier doing iris. Yay! Daniela Andrier and iris–I’m in! Accompanying this is the discontinuation of Tiffany for Men. They need to bring back the original. I was so disappointed in the new one. I cannot stand the smell. So sad. There is a return of the vintage scents. They should bring the original back.